Extend your business reach beyond Australia. With Optus International Inbound Services your customers can phone you free of charge from most of the world's major business centres using either a single global contact number, or a number specific to each country. You are in control, with our intelligent call handling features, the calls can be handled how, when and where you want. 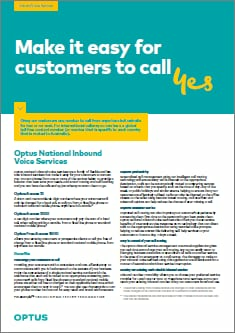 Optus International Inbound Services are available from over 30 participating countries and carriers where Optus has negotiated agreements. There are two types of International service available, each providing an International reverse charge service for your customers to call you free from overseas. Note that call charges may apply to customer calls from mobile phones or payphones to these services. Global Free Access - a local toll free number is provided for each country that your require access from, and the call is automatically routed to Australia where it is directed to your desired answering location. Universal Free Access - one global toll free number gives your customers the ability to contact you from any of the participating countries. Intelligent call routing - With our intelligent routing technology customer calls will be directed to the right destination based on criteria that you specify, such as the time and day of the call, or you can route calls to voicemail. Network Interactive Voice Response (NIVR) - Optus Network Interactive Voice Response enables you to play specific messages your customers, collect their response and route the call accordingly. Online service management - Optus Inbound Service Management is a web-based application that allows you to view and make real time changes to the routing configuration of your inbound services. Worldwide business growth and customer loyalty - When you give international customers or prospects an easy, inexpensive way to get in touch you’re more likely to attract their business. The service also allows you to switch calls at night to another location to compensate for international time differences. Inexpensive international marketing - Differentiate yourself as a company with a truly global perspective. You can even test the market in participating countries without having to set up local infrastructure. With Global Free Access there are no country or area codes, so your organisation can appear as a local business to potential customers. Reduce operational costs - centralise customer enquiries and minimise service costs, rather than having people all over the world answering calls. Getting started with International access is easy - simply select which type of service you want and contact your Optus Account Manager to tailor a package that suits your needs. Assistance is always available when you need it. Our service desk operates 24 x 7 for you to report faults. Self service tools Optus Inbound Service Management or for more sophisticated requirements Optus IntelleManager are also available for control and reporting of your Optus inbound services. Using a Universal Free Access number is simple. A caller dials the international prefix for their country - commonly represented by a '+' symbol - followed by '800' and your unique eight-digit number. Only the prefix changes according to the country from which the call is made. A Global Free Access number works the same as a toll free call in the country is it operating from. Global Free Access and Universal Free Access numbers are automatically routed to Australia to terminate at your call answering point. The answering point can be an overseas destination, for example to enable you to offer around-the-clock support from different parts of the world. Incoming international calls that are redirected overseas are charged for the incoming call and the outgoing call. What are international toll-free services? An Australian international reverse charge service for Inbound calls to Australia. Calls are free to the caller, and you pay timed call charges. Global Free Access (GFA) provides a national freecall number from each calling country. Universal Free Access (UFA) gives you one global number, which can be used to call from a number of countries. Where do I access Inbound self-service tools? You must be a registered user to gain access to these tools. How do I get billing and call traffic reports? Billing and call traffic reporting is provided by Optus Insight Plus a powerful management reporting tool. Give your customers one number to call from anywhere in Australia for low or no-cost. You can also have a global toll-free contact number (or number specific to each country) that is routed to Australia. 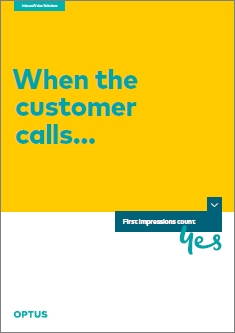 The experience callers have when they contact your organisation can be critical to your success. Discover more about the business of technology with Optus’ experts and industry leaders.